I had to sternly warn one hiker claiming interest in my climb this weekend. Snow was possible, our first day was long and difficult for a day hiker, and the nights would certainly be cold. The evasive, delayed answers, and a refusal to quote experience led me to diplomatically reject the applicant. This was a joint trip with the Sierra Peaks Section. Some four of us, from the north, joined several climbers from Southern California at the Kennedy Meadows Trailhead off Highway 108. They all had a long Friday night drive. Bleary eyed and tired from the start, this was a marathon event for many of them. We were fresher, and ready to go. Preparing our packs and overnight gear, the trip sheet had declared "12 miles and 4,000 feet gain" as the stats for today. A hiker that likes local chapter Point Reyes hikes isn't the type for this activity. 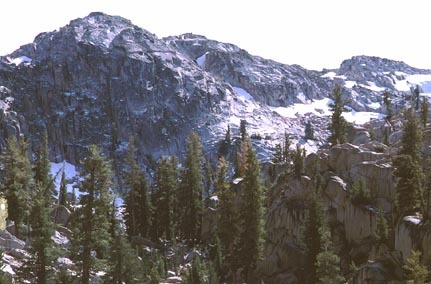 The trail follows the route of the Tahoe-Yosemite Trail. 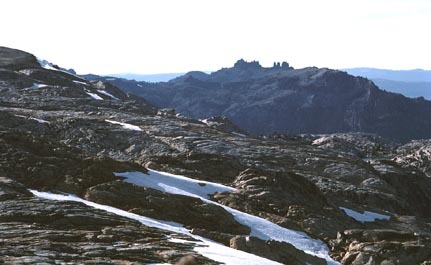 The T-Y Trail leads south to Brown Bear Pass many miles along. But we were not to go that far. Passing a large lake, Relief Reservoir, we crossed a raging stream on a well-constructed bridge, and hiked up and up. The days were shorter, so we didn't take much time unloading our backpacks, at roughly Lunch Meadow. We set up a quick camp. We were going to do the peak this same day. From camp, we hiked cross-country, with day packs, to nice views back to the ground that we had just covered. The afternoon light was getting low as we came to the non-descript granite summit. We dilly-dallied as I read and photographed the register. Other groups from the northern chapter had signed in. It's a mental relief to know most everyone is truthful about completing such climbs. With the light getting low, we hurried back to camp. Climbers tested new equipment, and had uplifting humor. One fellow had a blinking LCD cap, powered with small batteries. The mood became solemn. It was sure to be a cold night. I don't remember much, except that sometimes, on the first day, it's nice to have the peak climb in the bag already. Then you just have to pack out. I finally day-climbed this peak in 2000, since I like long hiking days. This avoids having to obtain an overnight permit. We packed out the next day in good sunny weather. What few fall colors were disappointing. The Southern Californians began their long drive home without much fanfare. They wouldn't have needed slow hikers. I made some photo stops on our drive west on Highway 108. There are vista points, one of Donnell Reservoir. This is a thin arch dam in a deep rock canyon. Some rock climbing is doable here. We came home early, and it was the other climbers that had a long drive home, for once. I probably don't win popularity points screening or discouraging people from attending my trips. But safety is my prime concern. There is a lot of mock, false encouragement from people who have little or no idea what difficulties they are referring to, regarding a peak climb. Some referrals are born of sheer malice. I have little doubt about the hate this local chapter now promotes. They will say, the stars, but the reality is a body bag. And, better to limit and qualify participation, than invite your unsuspecting, inexperienced, and misled co-workers, friends, or neighbors, for the sake of numbers. While this may work for a easy to moderate day hike, it doesn't, for climbing. You might then have a outings disaster. Our weekend stats were some 22 miles with 4,800 gain, round trip.